Long before we purchased Beatrice, I was on the look out for WiFi on the go. You see, I can work from just about anywhere as long as I am connected to the internet and have great cell service. I wrote a post previously on WiFi In Motion and I’ve now gone full circle having contacted the owner directly to speak with him about the differences in the industry and how WiFi In Motion will assist me with my traveling/working goals. Rob Taylo was very informative, helpful and provided the fun story and information below. I’m still doing lots of research on which WiFi system will best suit my needs but, WiFi In Motion is at the top of my list. Whether they’re home-schooled or you simply want to help them retain knowledge during holiday breaks, mobile internet for RV users can help keep your kids at the head of the class. RV internet using SinglePoint’s WiFi In Motion system lets you and your family get online while you’re on the road, so you don’t have to hear, “Are we there yet?” as often. Below are some ideas for learning activities to do with your kids on your next road trip. Carlsbad Caverns National Parks, New Mexico. During the summer, the whole family can enjoy the light show put on by Mother Nature. Find an online constellation map, get out a compass and start gazing upward. Gettysburg National Military Park, Pennsylvania. Experience history firsthand and show the family where the Battle of Gettysburg Civil War action took place. Prepare for the visit with a history lesson about the Founding Fathers and a stop in historic Philadelphia before taking the park’s self-guided auto tour in your RV. Rocky Mountain National Park, Colorado. Europe has the Alps, and the U.S. has the majestic Rockies. A trip to this park is a good way to introduce the kids to the world’s major mountain ranges and other geographic points of interest. Since sightings of bighorn sheep, elk and other wildlife are common, have the kids make a checklist of must-spot animals. Mount Rushmore National Memorial near Keystone, S.D. Where else are you going to see the faces of U.S. presidents carved into a mountainside? Mary Lou’s Milk Bottle in Garland, Wash. Enjoy a milkshake inside a milk bottle. Paul Bunyan and Babe the Blue Ox in Bemidji, Minn. This “roadside colossus” is a great way to revisit a classic American folktale. The Big Duck in Suffolk County, N.Y. When this building had its grand opening, there were more than 90 duck farms in the county. Superman in Metropolis, Ill. This “man of steel” is 15 feet of metal muscle. Albert the Bull in Audubon, Ia. Where’s the beef? Just look out the window. Learn some local history. Every place you visit has a story. By having your kids explore their destinations with the help of online encyclopedias, they can learn more about how a town has changed over the years (use the wireless WiFi for RV to find pictures of early settlers); discover the values of the residents; and see how decisions guide the future. 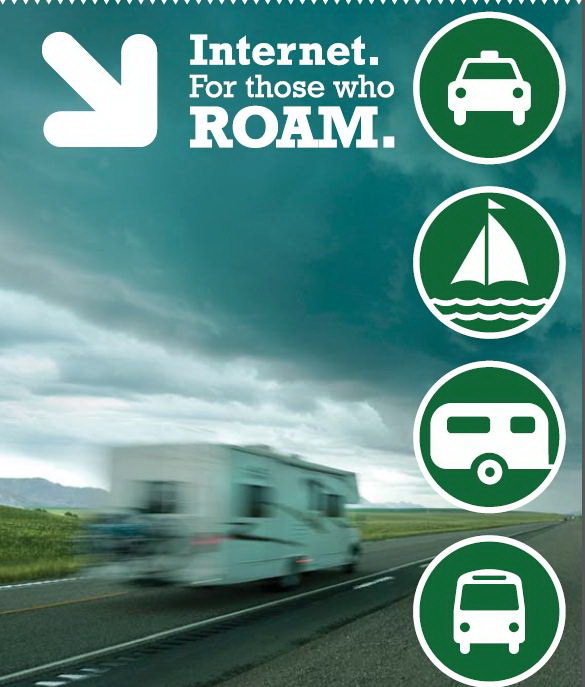 Mobile internet for RV users is simple to set up and gives your family a safe way to stay in touch, browse the Web and have access to the world at their fingertips as the wheels cruise the pavement. SinglePoint Communications offers innovative solutions for internet WiFi when traveling. WiFi In Motion is the SinglePoint system that allows you to receive RV internet or WiFi on a boat. It comes with your choice of antenna as well as a rugged router to turn your vessel or vehicle into an instant hotspot via a robust cellular signal. You can install the WiFi In Motion system by yourself or enlist the help of a SinglePoint expert. 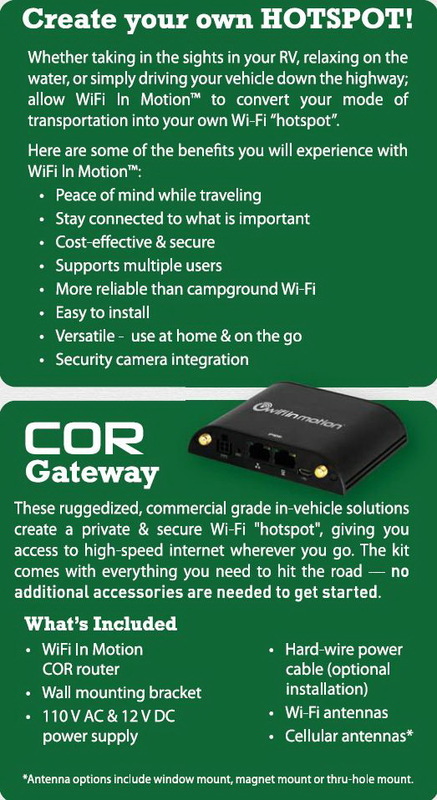 WiFi In Motion for RVs is a cost-effective, easy-to-set-up and secure way to connect to the internet. You can be anywhere and still have reliable wireless WiFi for your laptop or other electronic devices. Visit SinglePoint Communications online to get answers to frequently asked questions or feel free to contact us today for more information about the WiFi In Motion system and installation costs at 866-959-WIFI (9434). For additional WiFi In Motion pricing information, please visit our online store. Thanks so much for posting this! This is at the top of our list for if/when we get an Airstream, so I’d be very interested in reading further posts on it. Hi Molly, I hope your dream comes true of owning an Airstream!! They are magical. I will for sure keep you posted on what I decide and update on performance. It’s VERY important for me to stay connected via WiFi so I’m not taking this part lightly. Cheers!! Can’t wait to see what you decide upon. I need wi-fi in our Airstream too and have been putting it off and just relying on picking up a signal at places that we stay at. Ugh. I know Monica!! It’s so very important for me due to my job. I am doing lots of research and will keep you posted for sure!!! Just wish I could win the big lottery than I wouldn’t care about WiFi in Beatrice b/c I wouldn’t be “working” on the road, just playing!!! Thank you so much for the great post Anna and allowing us to contribute! As a thank you to you and your followers, SinglePoint is offering a special coupon just to say thanks. 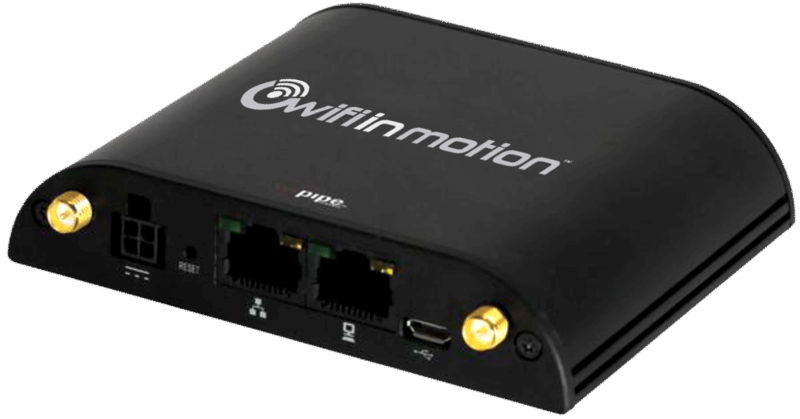 Simply use coupon code: Glamper to save $50 off of our WiFi In Motion system instantly. As a reminder, we love rewarding our customers who talk us up with their RV neighbors. Our customers are offer a $25 thank you when they refer someone who purchases a WiFi In Motion system from their referral. The person referred to us also saves $25 instantly. This is called our Referral Program and we would much rather put money back in our customer’s pockets than run costly ad campaigns. Please don’t hesitate to contact us if anything is needed. Thanks, Rob! I’m sure all who are reading will greatly appreciate the discount offer and the referal program. I have also posted your response on my Glamper Facebook page!!! Josh here from the BlinkPack blog. I recently purchased a ’69 Shasta Compact, and I am looking forward to taking it on the road. The only thing holding me back is connectivity. I would LOVE any tips you could send me about the best way to stay connected, not just with WIFI, but especially with cell or satellite service. Thanks! Hi Josh, thanks for your comment!! Will check out your blog today! Congratulations on your new Shasta. They are so darn cute. I will for sure keep you posted on what I find and end up purchasing for WiFi so I can continue to work easily from the road. Very important!! Cheers!! We are also looking for a wi-fi solution. The big thing seems to be the monthly subscription since we have a family of 7. We are considering getting a Millenicom plan. http://millenicom.com/plans/#hotspot-plan.